The inadequacy of St Nicholas as parish church of the rapidly developing resort led to a public meeting in 1818 to consider the building of an additional one (1 p203) at the northern end of the Steine. Its position marks the eastward shift of the town, as the resort consolidated. Probably because of doubts about local willingness to cover the cost, further action was delayed until 1823, when a committee was established to seek funding. The ensuing competition was won by Sir C Barry, then at the start of his career (A Barry p74) and construction started in 1824. The new church was to be on a grand scale and the Commission for Building New Churches alone agreed an initial loan of £15,000 (Dale p31) whilst the final cost was £21,865 (1 p209). The main contractor was W Ranger (ibid p207) and the new church was consecrated in 1828. Barry had initially been more at home in the classical style, but following the development of taste, increasingly used gothic for churches. His understanding of the style was to advance considerably, even before his association with A W Pugin at the Palace of Westminster, but St Peter’s remains a product of his early years, despite later changes. Barry is said later to have wished he could pull it down and start again (Sawyer I p25) and immediately following generations liked neither his use of Perpendicular gothic nor the facing of silver-grey Portland stone. The tower, planned from the first as a prominent termination of the view along the Steine, has a broad lower stage with a large entrance-arch and a heavy pinnacle at each corner. These are linked by a flying buttress to a more slender belfry-stage, which is derived from York Minster. Though flat topped, a spire was intended, but for financial reasons it was never built (1 ibid – a print of the design is reproduced on p208). Barry’s plan was symmetrical, with shallow three-sided ‘east’ and ‘west’ apses (actually north and south; for the sake of clarity the points of the compass are used in their liturgical not their geographical senses); that by the tower remains. 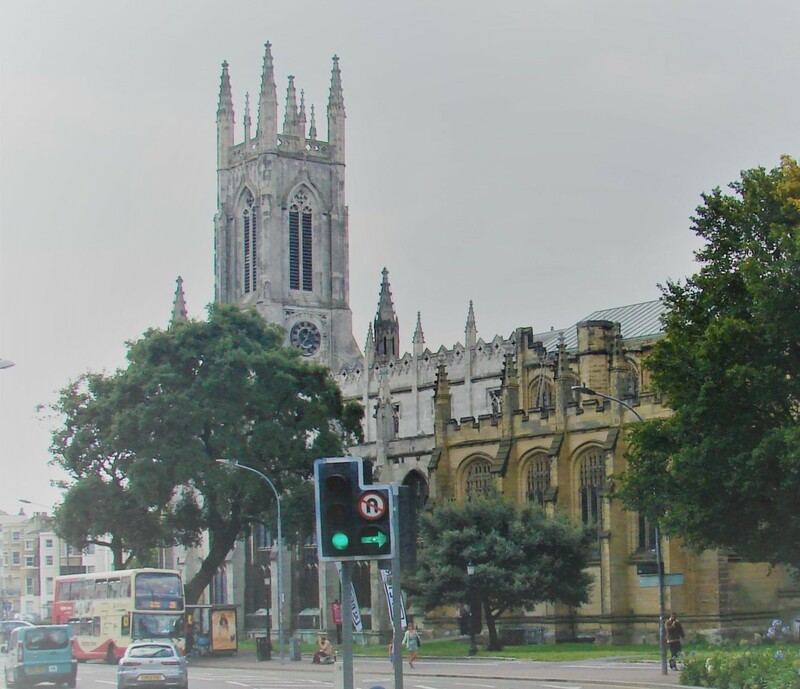 The body of Barry’s church seems out of scale when contrasted with the tower; he later deplored the division of its tall windows into two to allow for galleries (A Barry p75), now gone. 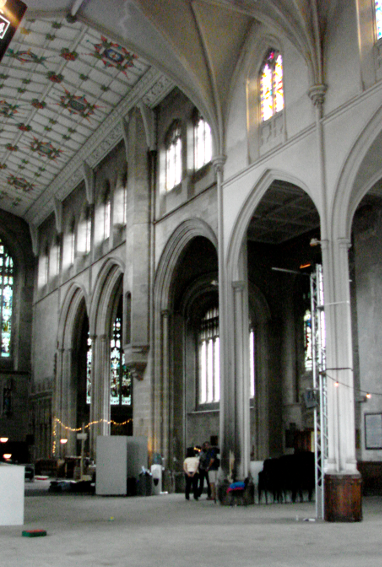 The clerestory is disproportionately low, with square-headed windows outside contained in four-centred arches inside, though most detail is reasonably accurate, except the low-pitched plaster vaults of nave and aisles. 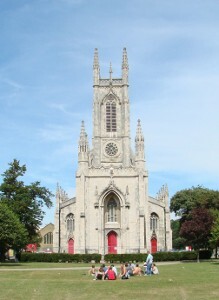 After St Peter became the parish church of Brighton at the parochial re-organisation of 1873, for which its commanding position was well suited, Barry’s plan seemed old fashioned, especially as the eastern apse was screened off as a vestry, with two pulpits in front (Horsfield I p146), so a new east end was proposed, to be more worthy of the enhanced function of the church and in keeping with contemporary liturgical standards. In 1874 Somers Clarke junior, who was the son of the long-time parish clerk, reported to a public meeting that the fabric was generally sound (B 32 p456), but proposed a chancel with a one-bay extension to the nave. However, the meeting noted ominously that funds had yet to be raised. As a provisional measure, the eastern apse was opened up and the west gallery removed (Sawyer I p38). Only in 1888 did work on a chancel begin, built on an undercroft with vestries and other rooms (BN 57 p471). The most obvious feature initially of this work was a new south chapel, which was not completed until 1898, presumably because of continuing financial problems; thus, work was stated to have been resumed in 1892 after an interruption (BN 63 p585). Although Somers Clarke is most usually mentioned in connection with this work, his partner until 1892, J T Micklethwaite was also involved (B 91 p516) and it is often hard to differentiate between their work. It is in fact likely that most of the work after 1892 was done by Micklethwaite, though as the partnership had not started when Somers Clarke first became involved, he may have been chiefly responsible for the initial concept. The extended north aisle and associated chapel were apparently built in parallel with the later stages of the south chapel, for they also were finished in 1898 (CDG 49 p11). This would have entailed the building of much of at least the western part of the main chancel, but it was another eight years before that was completed in 1906, the year of Micklethwaite’s death (BN 90 p896). Thanks to the greater space in the extended church the galleries were removed from the nave, which was re-seated. The panelling round the bases of the arcade piers may be presumed to date from the same time. The dark sandstone of the new work was criticised as unsympathetic to the existing Portland stone, by then more appreciated (e g by Goodhart-Rendel (AR 44 p26)), though Somers-Clarke justified it by his intention to reface the rest of the church similarly (ibid p109). The new work is Perpendicular in style, but this was less controversial, for by the late C19 taste had become eclectic. The style is used accurately, with a broad 11-light east window and large canopied sedilia. 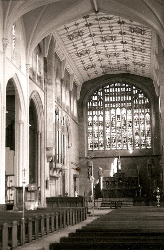 However, the intention, voiced as early as 1875, of replacing Barry’s plaster nave-vault by a slightly canted and panelled ceiling as was built in the chancel (BN 28 p8), was never achieved. The transition between the old and new inside is well managed. There is no chancel arch and though the detail of the new work is of stone, the proportions of the arches and clerestory are similar throughout. Certain changes are, however, evident, notably the presence of two clerestory windows per bay and the detail of the arches. The next major alteration was in 1966, when J L Denman undertook repairs and alterations (Dale p39), This included the decoration of the chancel roof in bright colours (BAL/MSS 41182) and a new organ case. By 2008 further repairs had become urgent, particularly to the exterior stonework and problems with subsidence were also reported. This coincided with the re-organisation of parishes in the city and in that year the church lost its parochial function. Following a period of uncertainty it was taken over as a church plant by Holy Trinity, Brompton in London. The whole interior has been cleared of fixed seating and the orientation reversed so that the main platform used for worship is at the west end behind the tower. The chancel is used for more informal events and many fittings have been removed. Altar Cross: J Armstrong, 1999 and 8ft high (CT 10 Dec 1999) (this still remains). Font: Large and octagonal of Sussex marble, designed by Somers Clarke, 1877 (B 35 p744). 1. (Clerestory) W Collins of London (Horsfield I p146), 1834. Brightly coloured and much of it enamelled, not painted. Only texts are displayed and the initials HMW recall H M Wagner. It is his only known benefaction to the church, which was commenced in the year he became vicar. 2. (East window) C E Kempe in memory of Queen Victoria, who kneels at the bottom right, 1906. The use of blue is unusual in his later work. 3. (Aisles and south chapel) C E Kempe and Kempe and Co (dated 1880-1933). 4. (West window of choir room – not normally accessible) A J Dix, 1927. Heraldic (www.stainedglassrecords.org,retrieved on 16/2/2015). 5. (North aisle, fourth window) Tree of Jesse by H Easton, c1936 (Dale p39). 1. (West end) Joseph Allen (1831?) by W Pepper senior (Roscoe p970). 2. (West end) Mrs Crozier, also by W Pepper senior (BE(E) p168). 1. (Main) In the Flemish style with carved figures, designed by W H R Blacking, probably in 1926 (Elleray pl 26). It replaced one of 1877 by E L Blackburne (BN 33 p231). 2. (South chapel) G H F Prynne, with painted panels by his brother, E A F Prynne, c1918 (this still remains).